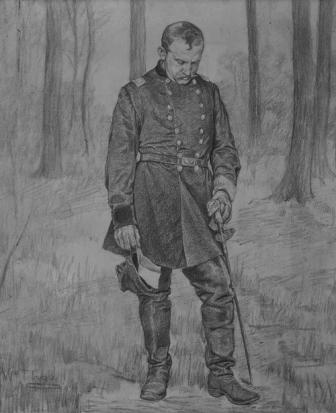 An officer of the Union army stands alone in a wooded area with head bowed, his left hand resting on his sword, while his right hand holds both his cap and a letter. He has obviously received unhappy news while in the field with his troops. The stance and attitude of the soldier is similar to another smaller pencil drawing of a Cavalryman housed at the Mercer Museum. In addition, a surviving photograph of a lost Trego painting shows an older Union officer on the battlefield in a similar pose, also holding a letter. Whether the two sketches and the painting were all part of the same project is unknown. This sketch can be partially seen hanging in the background in a photograph of Trego in his studio with The Rescue of the Colors in 1899. Obtained from the artist by a member of his cousin Howard Trego’s family, it has been passed down in the family ever since. The drawing was at one time stored in a garage and suffered damage. When retrieved by the current owner some years ago, it was very brittle, and there were holes that had resulted in losses of the drawing in several areas. It was also somewhat grimy. It was conserved and restored in 2010 by Elizabeth Wendelin and is now in excellent condition.